Full Moon in Leo: This is traditionally a most visionary and theatrical Full Moon, the radiant bearer of spectacular breakthrough and inventive ideas. The Full Moon is exact on Friday 14 February 2014 at 23:53 GMT. The effects, as for all full moons, will begin two days before and end two days after. The two days preceding a full moon can challenge the perspective of ordinary reality and are ideal to release pent-up emotions and excess energies. The function here is to bring balance between the areas where the Sun and the Moon are. With the Aquarius-Leo axis, the integration is between group and individual consciousness. During a Full Moon the sexual energy reaches its climax, making the whole body a vast erogenous zone eager to express and act out. This is one of the reasons why the Full Moon has always been regarded as the best time for dynamic group rituals and trance dances. The Full Moon is a vibrant and stimulating time, revealing the hidden mechanics of the interaction between polarities. The lunar cycle, which started with the New Moon on 30 January (click here for details), reaches the culmination with the Full Moon. The sign where the Moon was placed at New Moon, which in this case is Aquarius, defines the basic Intent. Hence, this current lunar cycle based on Aquarius, features themes such as: freedom, independence, community, synergy, inventiveness, deep friendship and companionship. being in the limelight with whoever and whatever you are, feeling totally entitled to be yourself and radiate your inner star. letting go of the stagnant and addictive safety of your routine, and taking a quantum leap into the unknown, doing what you have been postponing for long and facing your fears to follow your heart. On a Full Moon whatever was conceived during the New Moon, requires direct disclosure and achievement. 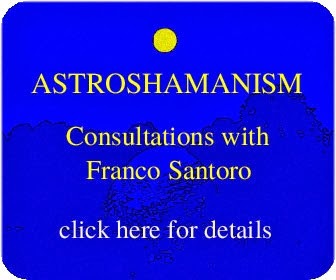 Here you confront the practical implications of any Intent you set at the beginning of the lunation cycle. The energy of Aquarius and Leo combined in this Full Moon shed light onto the awareness of our global consciousness and on how my identity and gifts fit with the wider context. The focus is on bridging the collective with the individual, together with the generous search for the fragmented parts of my extended nature. This Full Moon stirs up the quest, the pull to release what is familiar and to explore long forgotten and out of bound territories, triggering a multidimensional shift of perspective that brings genuine change. It implies letting go of the safety of our home environment and setting off on a novel journey. It also entails the availability to return and share the wisdom acquired during the quest, devoting time to integrate the new with the old, supporting healing and reconciliation. The exact position of the Sun (26° Aquarius) and Moon (26° Leo) at Full Moon in your astrological chart may indicate the nature of the Sun-Moon dynamics as they apply to your individual setting. Hence expect some unpredictable, original and significant developments in the area where the Full Moon falls in your astrological chart. The energy of the Full Moon inescapably confronts with the realm of relationships and whatever is unconscious in that sphere. Here again the challenge is that relationships are unavoidable, no matter whether according to ordinary reality I am in a relationship or not. In this context, “wanting to be in a relationship” is an absurd Intention, for we are all constantly involved in relationships, whether we are aware of it or not. What truly counts is to gain awareness regarding the nature of such relationships and making the best out of them. If I acknowledge the relationships I am already in and consciously decide to heal and work with them, new relationships can develop and old ones can transform themselves and become new relationships. 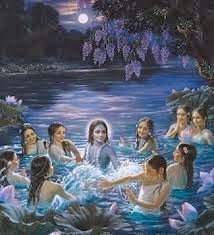 The Full Moon in Leo aligns with a paradigm shift that potentially allows me to perceive and experience what is happening beyond the veils of ordinary perception.The Opening picture of this article depicts Krishna bathing in the Yamuna on a full-moon night with Radha and the eight Gopis.